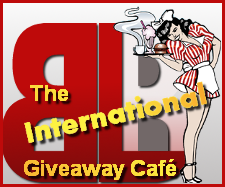 The International Giveaways Café (107) | Book Lovers Inc.
Good morning/afternoon/evening all and welcome back to the best place on the web to share your own bookish giveaway or to enter the ones listed here. Hope you all have great weekends, wherever you are in the world! Jackie is a quirky mom, living in Ontario, Canada. She's a bookkeeper by day and a book lover by night. She also blogs at The Novel Nation and writes occasionally for Heroes and Heartbreakers.